Fossil fuels such as oil, gas and coal are currently cheap, they can be stored and they pollute, not just during combustion but also extraction. Oil fields, coal mines, quarries, fracking, etc. create major pollution in natural environments. Fossil fuels are not found everywhere; they are an economic natural and power resource in a small number of countries. Current production volumes of fossil fuels will gradually decline and become more and more expensive, especially oil and gas. Fossil fuels account for approx. 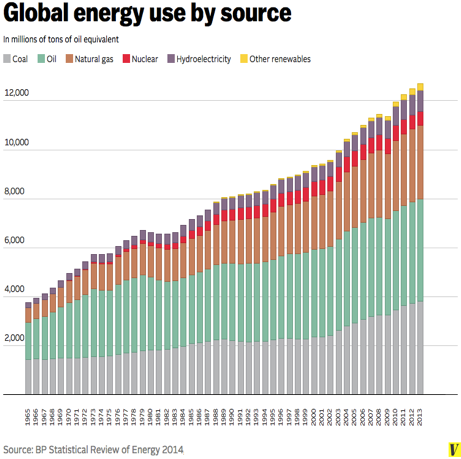 80–85% of the world’s energy and are increasing rapidly every year. Hydro power is usually quite cheap and storable. The enormous dams have a dramatic, irreparable impact on nature. There is a degree of risk that dams may burst. Hydro power is limited, a natural and power resource in a small number of countries. Hydro power currently accounts for around 6–7% of global energy production. Wind and solar energy are expensive, and the energy has to be consumed immediately. Wind and solar energy exist to varying degrees in all countries. Production of energy via wind and sun is marginal, accounting for around 1.5% of global energy consumption. Biofuels are expensive and are far from being feasible replacements for oil, gas and coal, as the earth’s arable space has essentially already been used, primarily to produce food for a growing population. Biofuels produce more atmospheric pollution during combustion than, for example, gas. The most dangerous aspect is probably the vast amount of nano particles. Biofuels, forests, are not found in all countries, forest is a natural and power resource in some countries. Biofuels, wood and waste, account for around 2.5% of global energy production. Nuclear power can be stored and is relatively cheap. Uranium mining is associated with major risks. Nuclear power production can involve meltdowns and the material is used to make nuclear weapons. One unsolved problem is the disposal of nuclear waste. Nuclear waste has to be stored for 100,000 years. There are already hundreds of thousands of tonnes of nuclear waste all around the world that have not yet been disposed of. Nuclear power is therefore a major source of concern for many people. Uranium is found in a small number of countries, a natural and power resource. Nuclear power accounts for around 4–5% of global energy production. HyMeAir now presents a new, unique invention, to use Nano Towers to make use of the hydrogen and methane in the air. This energy source, normal air, can probably replace all other energy sources and solve the world’s energy, climate and environmental problems. In the best case, HyMeAirs new technology could give us virtually free energy, virtually free of emissions and storable. The invention is, like the best inventions, simple, using new technology in the form of nano filters in Nano Towers to filter out the methane and hydrogen contained in the air when the wind blows. This could, for example, involve a combination tower for both methane and hydrogen, or separate Nano Towers for each individual gas that we wish to extract.